Find whatever text you want to search with textseek. Just hit the search box with text you want to search in a file and then result will be shown like google search. Download 30 days trial version from the official site of textseek and after you can buy personal and business version of Textseek Desktop Search. 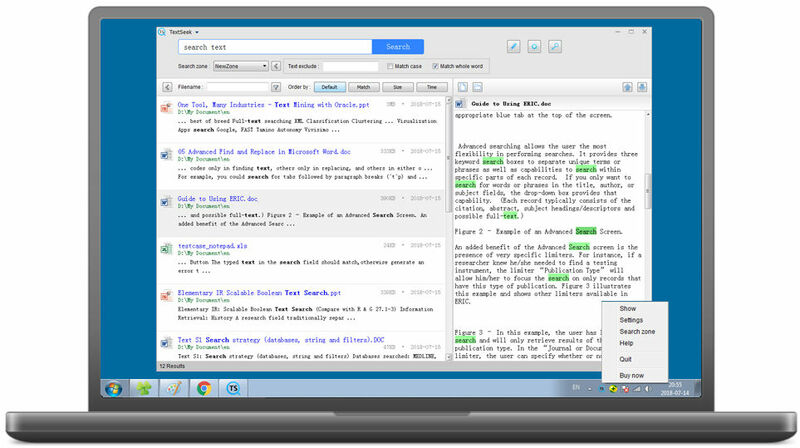 Now will see features and benefits of the Textseek Desktop Search. Search Technique: Simple search technique. In the Textseek Desktop Search, select the file in which you want to search. Then apply search keyword and then searched text will be given in highlighted area of the file. Supported File Formats: Every popular file format which is mostly used to describe with a text is supported. It supports various file formats of Excel, Word, PowerPoint, PDF, RTF, and other text related files. Custom Search: You can define various zones of one project. Categorized them in zone with the type of file. Folder wise you can put up and then with some clicks of browsing of these zone files you will be able to search in it. Filter Methods: Apply filter what kind of result you want. To increase a search result Textseek provides four methods of advanced filtering. These are case, whole match and exclude. Using these advance filter you can get high accuracy in the search result. Settings: General and advanced settings are there in Textseek. In general settings, you can set the language of the text, highlighted text colour, font type and size. In advance setting some scan and search results settings are laying. Textseek helps you to search content in windows and MacOS files. Textseek has overcome windows delayed and no search result query. By advanced search indexing technique in Textseek it is resolved. To avoid text omission filename, document content is included in the search engine. It is beneficial in better search results. Parsing a document with the full-text scan and then render and search. You can use textseek in business and personal use. In the business license, you can purchase a license for office machine which helpful in business documents. In personal use, you can use in some educational purpose and private use. 3. In general, the coupon can be applied for all products of Text Seek.